For me the wastage of food in today’s society reflects the wider nature of our throwaway culture and commoditisation of products that has disconnected individuals and businesses from being able to understand and engage with how food is produced and take care in how it is used and what comes of it. The wastage of food remains a critical issue economically, environmentally and socially with 30 to 50% of all food grown estimated to be wasted representing an economic loss of $750 billion annually. Currently enough food is wasted by the United States alone to feed the world’s one billion malnourished people which reflects the present paradoxical situation where the developed world has too much food and the developing world to little. In the UK, 15 million tonnes of food is wasted each year across different stages of the food supply chain and also at consumer level. There has been a significant drive to tackle food waste at the household level with WRAP (the Waste and Resources Action Programme) undertaking a campaign to promote steps that can be taken by consumers. WRAP has also engaged with businesses across the supply chain but despite the progress made by some firms, there is yet to be a blanket approach to tackling food waste across the food industry, particularly a strategy that priorities preventative action over solutions that focus on a reduction of waste material. With the issue gathering momentum in the media, companies across the supply chain such as retailers, manufacturers, processors and farmers are under pressure to manage their waste in a responsible and sustainable way. The Courtauld commitment was introduced by WRAP in 2005 as a way of engaging with the grocery sector to reduce the environmental impact of their operations. The voluntary commitment was adopted by 53 brands and retailers involving a reduction in food and packaging waste over three stages. Despite the emissions savings achieved, the commitment has been criticised for not setting more ambitious targets as well as its voluntary nature. Of the 53 signatories, few are processors and manufacturers of food which remain an under represented area and a priority in tackling food waste in the supply chain. With the third stage of the Courtald commitment ending in 2015, consultation activity and discussions are currently underway to develop a 2016-2025 follow-on agreement. This is Rubbish, a food waste campaigning organisation, is calling for an improved more ambitious Courtald. The ‘Stop the Rot’ campaign calls on WRAP to target a number of key areas in developing the 2025 Courtauld Commitment. One of the most important is the need for a more transparent auditing process in the grocery sector across the supply chain as it is currently unclear how much food is wasted at different stages per product. 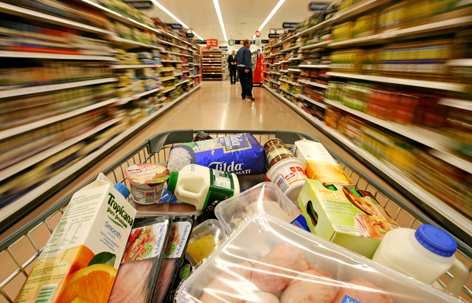 Tesco has recently taken an important step in auditing the waste of some if it’s most popular products and there is a need for all retailers to follow this example. There is an overall need for the next Coutauld commitment to engage in more holistic supply chain measurements of waste, particularly at the pre-factory gate level as well as a call for retailers to take a greater responsibility for the food wasted before it reaches the store. The campaign also calls for further improvements such as more ambitious targets with the previous Courtauld commitments falling short of what is required in accordance with international goals. Better implementation of the waste hierarchy is also emphasised involving the promotion and preference of preventative actions over ones that solely reduce the amount of waste material. An end to the current period of self-regulation and voluntary commitments and a movement towards more regulation is also important to ensure that businesses both engage and meet the goals set. 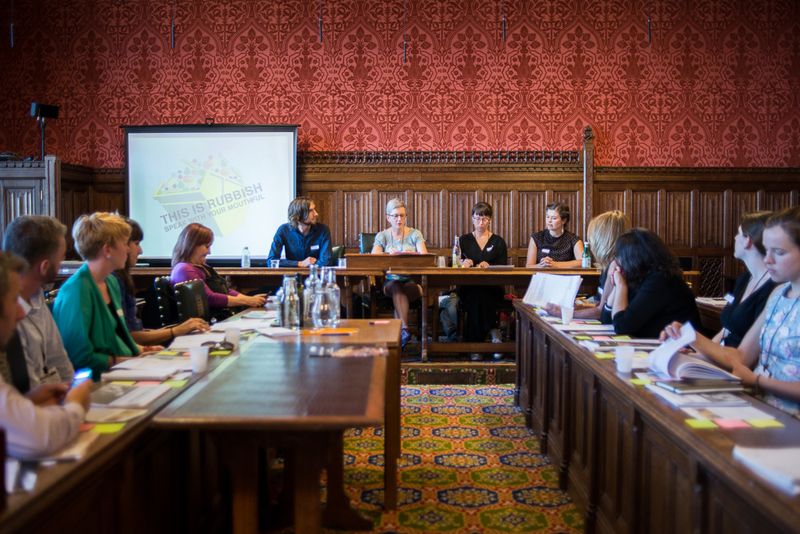 To develop their campaign, in July 2015 This is Rubbish invited a number of people who work in the area of food waste to the Houses of Parliament for a roundtable discussion. 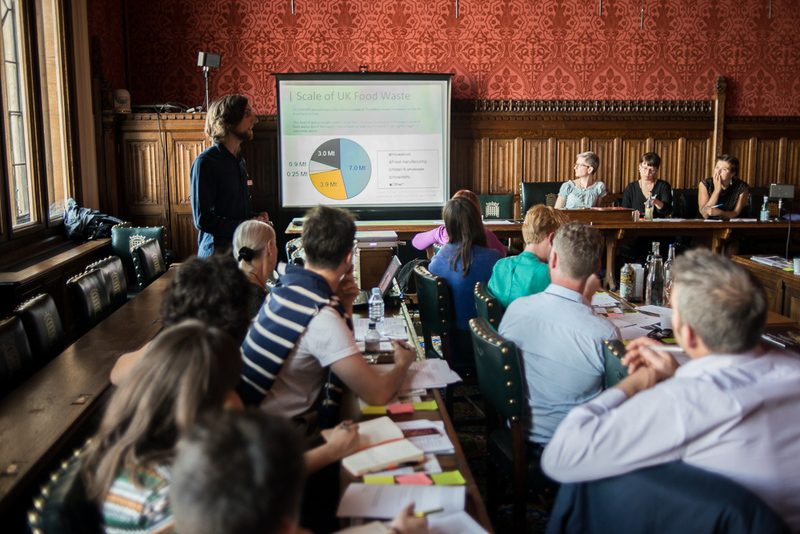 The event was organised in collaboration MP Kerry McCarthy who brought a food waste bill to parliament in 2012 and aims to do the same in 2015. I was lucky enough to be invited to the meeting and really enjoyed the opportunity to meet and discuss such an important issue in such an important place. Held in a meeting room overlooking the river Thames, members of the audience were able to question and debate the campaign being developed. We also collaboratively engaged in developing innovative communication strategies and discussed how our organisations could help partner the campaign going forward. A number of interesting points were raised at the meeting. 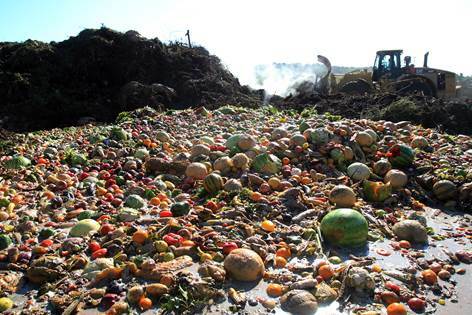 For example food wasted at farm level is being ignored by current strategies to tackle food waste. Waste at this level is often designated as losses rather than wastage and excluded from auditing. A topical issue was the overall lack of accountability by the grocery industry adjudicator over the issue of food waste and the critical need for retailers and supermarkets to take responsibility for how their actions, such as the product specifications of fruit and vegetables, cause food to be wasted across the supply chain. We also heard a surprising story of how farmers are selling surplus food as animal feed or transferring food that would otherwise be wasted to anaerobic digestion rather than re-distributing food to charity food banks. Questions were raised over how more transparent auditing would work in practice if more comprehensive measures across the supply chain were implemented, particularly the nature of the methods to be used. Overall I found the key issue was engagement with industry as only 53 companies committed to previous stages of the Courtald. If the new 2015 to 2025 commitment is to have an impact a greater proportion of companies across the supply chain need to be involved as well as retailers taking accountability for how their actions influence wastage at farm, processor and manufacturer level. The Courtald commitment could also be a catalyst for competition between companies to both achieve and go beyond food waste prevention and reduction targets. Jordon Lazell is a Research Assistant at the Centre for Business in Society and is interested in consumer food waste behaviours and strategies to mitigate food wastage. He is currently undertaking a PhD on a part time basis which seeks to explore the transition of food into waste across different consumption spaces with everyday urban lives. Bray J. 2013. Food Waste – The Policy Perceptive. ‘Waste Not Want Not: Agro-Food Waste Solutions for a Hungry World’. Held 5th March 2013 at The Society for Chemical Engineering HQ. SCI Agri-Food Hub: London.